Bowl in the Ocean! 16 full lanes of bowling that offer a unique underwater ocean experience! Custom bowling balls that bear the likeness of octopus, mermaids, camouflage and more! 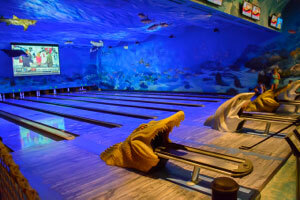 “Dock” wooden lanes feature underwater scenery of sea turtles, sharks, stingrays and other saltwater species! Hand painted murals and fish hanging from the ceiling bring everything together for a deep-sea dive like no other. You have to see it to believe it! Make sure to visit Uncle Bucks Fish Bowl and Grill during your vacation in Destin.